ELKO, Nev. — It’s not often that the prospect of a humanities lecture stirs protest. 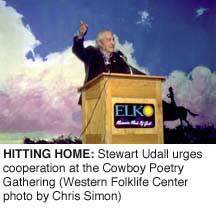 But that’s what happened when former Interior Secretary Stewart Udall was invited to give the annual lecture at the 17th annual Cowboy Poetry Gathering. The Elko gathering has become the state’s premier folklore event, and it brings about 8,000 people — and more than $6 million — to town every year. This year, the local newspaper displayed more anger than anticipation, publishing indignant letters calling Udall an "extreme environmental activist" who had dedicated his career to "killing the cowboy culture." Elko has been racked by angry disputes over public lands in recent years. Last year, the Jarbidge Shovel Brigade, a group dedicated to reopening a road to a wilderness area in northern Elko County (HCN, 7/31/00: Kicking and screaming in Nevada), staged a big parade during the Cowboy Poetry Gathering. 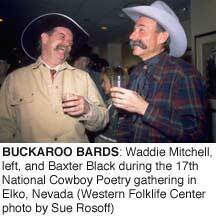 At this year’s gathering, Waddie Mitchell, an Elko County buckaroo who has become a famous cowboy poet, touched on these divisions during his impassioned keynote speech. Mitchell said that a decline in ranching could lead to the demise of the culture the gathering celebrates, and he blamed environmentalists and the federal government. "Cattle ranchers and buckaroos lived pretty well here, until a small faction of people in the late ’60s and ’70s became dedicated to removing livestock from the range," Mitchell said. "Today there are now fully 40 percent fewer cattle in the Great Basin region alone than there was in 1984, when we were just starting this poetry gathering up." At the end of his speech, Mitchell asked a question that would hang over the rest of the gathering: "Are we here to celebrate this lifestyle, or eulogize it?" Because of the tense atmosphere, sheriff’s deputies accompanied Stewart Udall into the packed room for his talk. Udall offered no apologies. "I am an environmentalist," he began. This claim was undisputed: The former four-term congressman from Arizona was Interior secretary from 1960 to 1968, a time which saw the creation of four national parks, six national monuments, eight national seashores and lakeshores, 56 wildlife refuges, the Land and Water Conservation Fund, the Wilderness Act, and the Wild and Scenic Rivers Act. But Udall added, "There are various degrees of environmentalist. We don’t have a church and you have to believe certain things." Udall himself is not a stereotypical environmentalist. He was born and reared in the rural ranching and farming community of St. Johns, Arizona, a Mormon settlement founded by his grandfather. "People settled their disputes with their fists," he remembered. He left Washington in 1969, after serving as Interior secretary under presidents Johnson and Kennedy. In his talk, he pointed out, "I went home to pick a fight with the federal government" — representing Navajo uranium miners in a long legal battle for compensation for health damages. Since leaving government work, Udall has been a lawyer, author, lecturer, historian, scholar, and advocate of cooperation in the modern West. His rambling, discursive homily touched again and again on the cooperation among people and within communities that had been essential to the settling of the West. And it hit home. Despite the recent political maelstrom in Elko, despite the anger evident in Waddie Mitchell’s keynote address, there was no visible protest once the lanky, gray-haired 81-year-old began to speak. One reason is that the Cowboy Poetry Gathering has become a surprising haven for calm dialogue and creative thinking in the ranching community. It’s a place where some of the weaknesses of ranching, such as environmental problems and family finances, can be discussed openly, and new paths for survival explored. Hal Cannon, the founder and director of the gathering, said the dialogue between people who make a living from the land and environmentalists is deeper than it has ever been before, especially at the gathering. Cannon said he never expected the event he created to play such a role. Still, he’s not surprised. "People who come to the gathering love the place and love the poetry of the place," he said, "and I think that’s an interesting place to start." "The most creative people in ranching tend to be there at the gathering," said Preston Wright, an Elko-area rancher. "Besides creating poetry and music, they’re also thinking about these problems. You’re likely to find a different take, cutting-edge or outside-the-box thinking on the same old problems. There are definitely more and more guys, more and more ranchers, who understand that we have to work with those people, that we have to work with environmentalists, quote unquote." Udall’s message of cooperation was also reflected in workshops at this year’s gathering, where environmentalists, ranchers, financial planners, and ranch consultants discussed ideas and tools for preserving family ranchlands. "An environmental-ranching alliance is the last best hope for the preservation of these areas," said Charlie Seeman, executive director of the Western Folklife Center. "With Stewart Udall, the ranching workshops, these conciliatory and forward-looking approaches, that’s where we as an organization are going. We’re trying to do something substantive so that this isn’t a eulogy." At the end of his talk, Udall offered a warning from his personal history. His grandfather was involved in the Mountain Meadows Massacre, he said, in which a Mormon brigade killed a group of settlers traveling through Utah and blamed it on Indians. "It haunted Utah and it haunted my family, I can tell you," Udall said. Over the years, two men, one from each side of the tragedy, began talking to each other. And a few years ago, people from some of the families on both sides, as well as representatives of the Mormon Church, came together to dedicate a memorial at the site. Udall recited a poem he had written for the dedication. He spoke of the people coming together to recognize their history. "The balm they bring is love," he said, "the only ointment God offers to heal unhealable wounds." The crowd rose to its feet, giving Udall a standing ovation. "It was a very sophisticated and considerate reprimand of all the people who might be out there thinking he had no business there," said rancher Preston Wright. "He talked about the kind of horrific outcome you could have if you carry these divisive emotions to the fullest extent, how horrible it was, and how long it took to get over. Part of it was a warning of the worst possible outcomes of such behavior. "But it was also a hopeful message," Wright said. "By communicating and accepting, we could get beyond those things." Jon Christensen is the editor of the Web site www.GreatBasinNews.com, and writes from Carson City, Nevada.